It's that time of year again, when all you sadistic bastardslovely people get to decide the subject of an upcoming blog review. 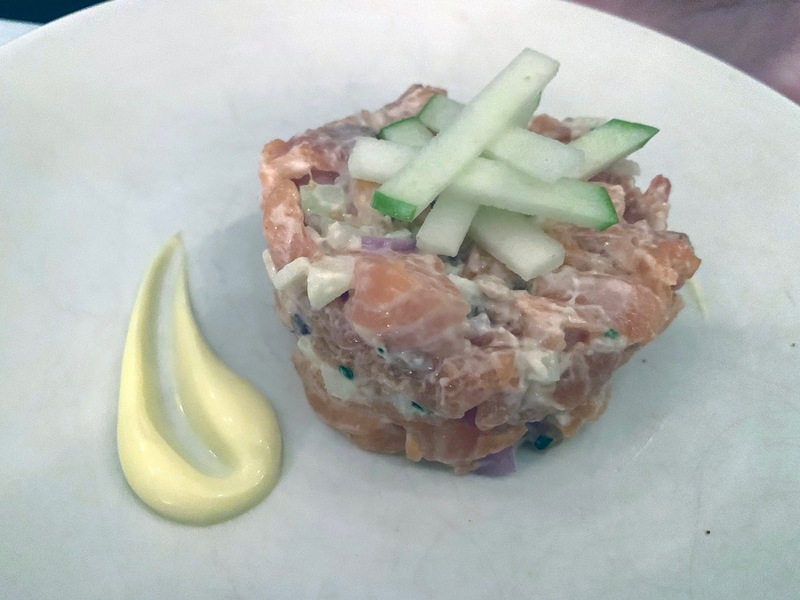 Each year we go through the same rigmarole of my offering a list of restaurants I actually want to go to, which get roundly ignored in favour of a list of absolute shitshows that people have added themselves. But you know what, I am nothing if not an optimist so I'm going to get you started off with a selection of some of the country's best restaurants that I've not yet been to (or not booked in to go to, which is why Sat Bains isn't on the list - I'm going in March) and even if they get ignored at least I can say I tried. 3. Please check the restaurant you want to vote for hasn't already been added before you add it yourself. I'll close the voting in 48h, so 2pm on Wednesday. That should be long enough for a representative sample. There is a way of getting the absolute most out of Bonnie Gull. 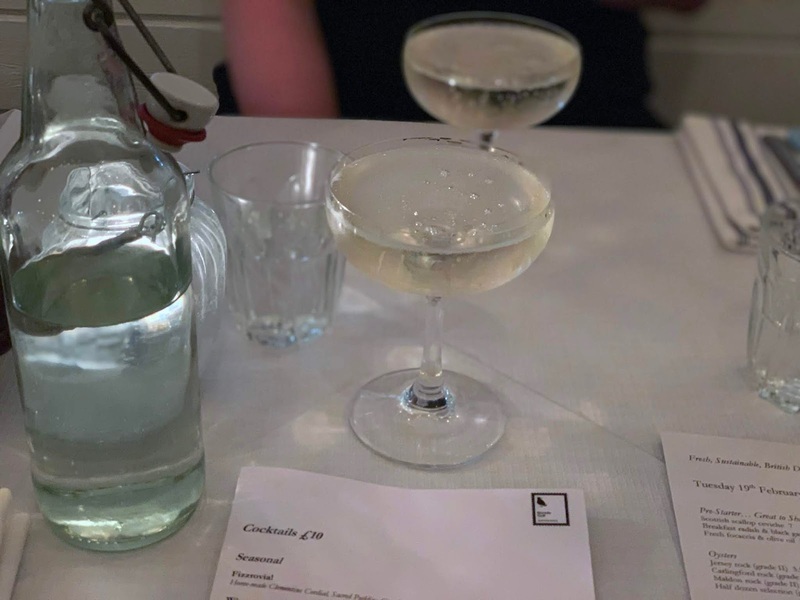 Between the hours of 4pm and 6pm every day, this friendly little bistro in Fitzrovia (there's also one in Soho) serves glasses of prosecco for £5 and oysters for an incredible £1 each - cheaper than you can get them retail from most fishmongers. It makes it the perfect spot for a bit of classy pre-dinner bubbles and nibbles, and for this extraordinarily generous offer alone they deserve much praise. 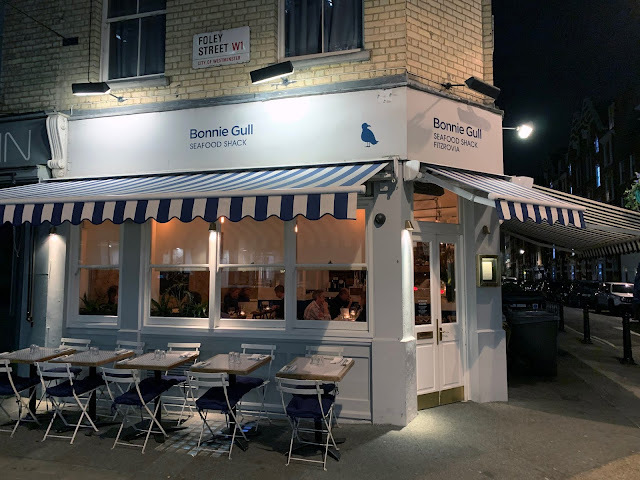 Unfortunately, aside from £1 oysters and prosecco, not everything at Bonnie Gull is worth shouting about, but let's start with the positives. Firstly, it's an utterly charming little room, and though perhaps they can be accused of stuffing in slightly more tables than makes for comfortable amounts of personal space, it all seems to fit with the neighbourhood bistro vibe. Service, too, is right on point - friendly and relaxed but efficient and attentive, easily done you could argue, in a room of this size, but very welcome nonetheless. 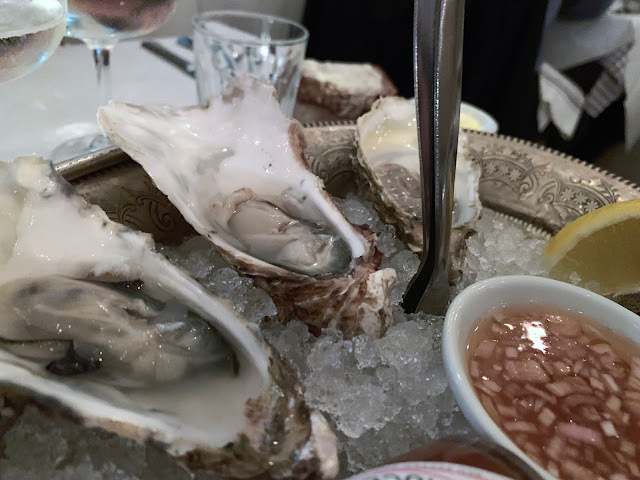 Oysters - between £3 and £5 each once the happy hour wears off, so not exactly a bargain but within the bounds of acceptability - are expertly shucked, and served absolutely correctly, ie. with a choice of mignonette, lemon and tabasco sauce, all bases covered. Once doused in tabasco, lemon and the like I didn't detect much of a difference between the advertised three varieties of Jersey rock, Maldon rock and Carlingford rock[sic] (did they mean Carlingford Lough?) but they were all lean and fresh and full of seasonal goodness. This really is a very good time of year to be eating oysters. From then on, well, things were rather more mixed. Sea trout tartare was quite heavy on the mayo and could have done with some more aggressive seasoning, but the soda bread it came with was genuinely brilliant - fresh out of the oven, or at least freshly reheated, soft and sweet and utterly moreish. Whole bream was sadly overcooked. 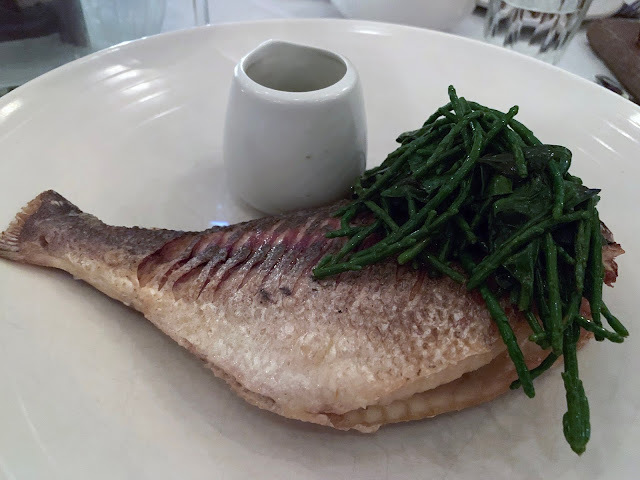 The flesh inside was mushy and difficult to separate cleanly from the small bones, making eating it more of a chore than you'd hope than when spending £30 on a fish; even a generous pile of crunchy samphire couldn't save it. 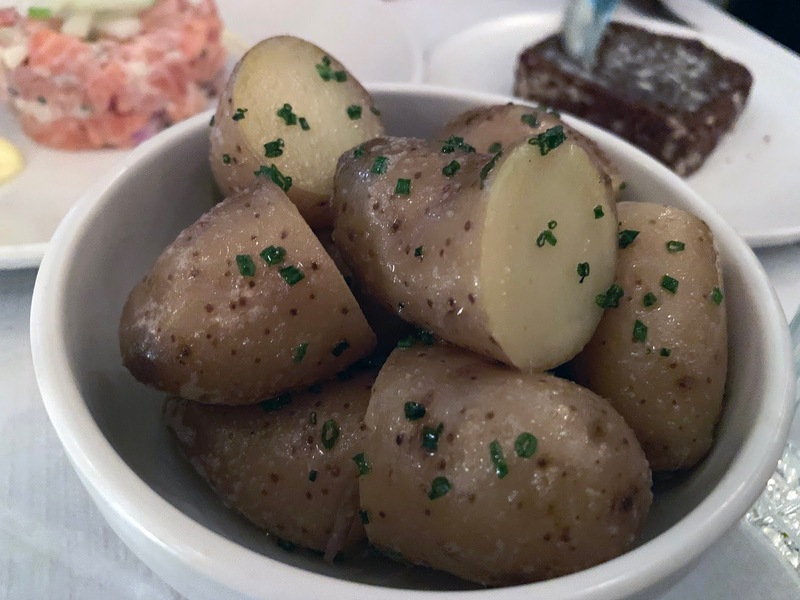 And the grandly-named "Ratte potatoes with mixed herbs emulsion" were very little more than plain boiled potatoes, with a rather unpleasant floury texture and in dire need of butter or seasoning to liven them up a bit. 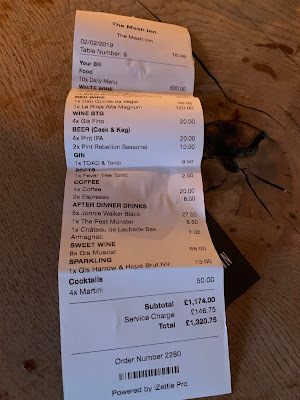 We didn't stay for dessert and only had a single £6 glass of prosecco to wash it all down with, but somehow still racked up a bill of £77.50. And that is a lot of money to be paying for school dinner potatoes and overcooked fish. But when I think back to those lovely oysters, and the charming service, it's hard to be completely down on Bonnie Gull. If I'm ever in the Fitzrovia or Soho areas between 4 and 6 I am almost certainly going to be a very happy Happy Hour patron. In the end, of course I can't wholeheartedly recommend a seafood restaurant that can't cook fish very well. But as an oyster and champagne bar, it does very well indeed. After twelve years writing about food in London and elsewhere I occasionally like to flatter myself that there aren't any major world cuisines that remain a complete mystery to me. In a city like this, with a population drawn from every corner of the globe, practically every genre and subgenre of food is catered for in some form or another, and I'm more than happy to jump on the tube the moment I hear rumours of a new one to tick off the list. Surely I've covered more or less everything over the years? Well, in a word, no. The fact is, I'm constantly reminded just how little of the complexities of world cuisines I've experienced, and how many there are I'm still to be discovered. China alone, a country of one and a half billion people, has (according to this website I just found) eight major distinctive cuisines, and countless local variations, colours and accents, not to mention the infinite varieties borne of bleeding and merging between the regions themselves. X'ian, a city in central China known to most westerners (if it's known at all) as home to the Terracotta Warriors, boasts a population of 12 million people - 4 million more than London. There are probably a thousand different types of X'ianese cuisine, never mind the more general Sichuan supergroup it's part of. So back in Shaanxi province, there could be a restaurant such as Murger HanHan on every street corner. Maybe you can't move for handmade Biang Biang noodles as thick as a cowboy's belt and twice as long, or spicy murger buns. The residents of Xi'an possibly serve little else. But here in London, I think I'm allowed to say that food like this is a rarity, and is without question one of the most deliriously exciting discoveries I've made (after a couple of mates went first and told me about it) in a very long time. Needless to say, trying to pretend I've made any kind of "discovery" of Murger HanHan is laughable - for a start, the original site in Euston (called Murger Han) has been open years, and on a Thursday lunchtime, right at doors-open at midday here in Mayfair, nearly every single table in this restaurant was taken, a mix of local workers and curious tourists. Service coped perfectly well with the onslaught - we were seated smartly and orders taken within minutes - although with an attitude to the task best described as "humourless". 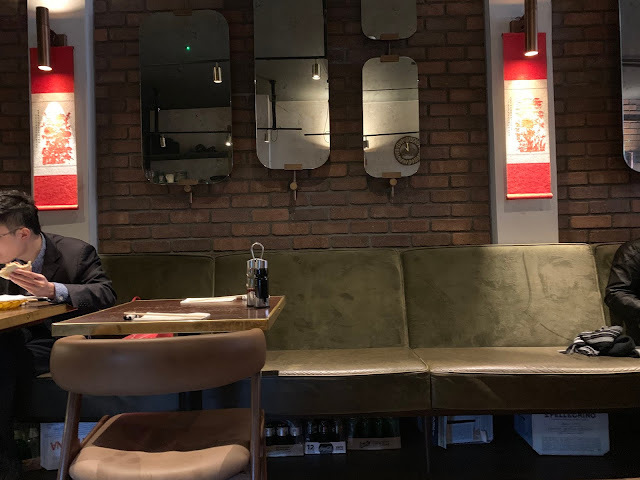 I know I'm hardly the first person to moan about friendliness of service in Chinese restaurants, but it seems a shame that with them doing almost everything else so right, a bit of time in charm school for the front of house would make all the difference. Anyway, to the food. First to arrive, and ordered largely for the sheer novelty factor, were these skewers of "surf clams", a bivalve which apparently can be found all the way around British shores but which must generally command a higher price abroad (particularly in Japan, for use in sushi) as I've honestly never seen them on a menu in London. 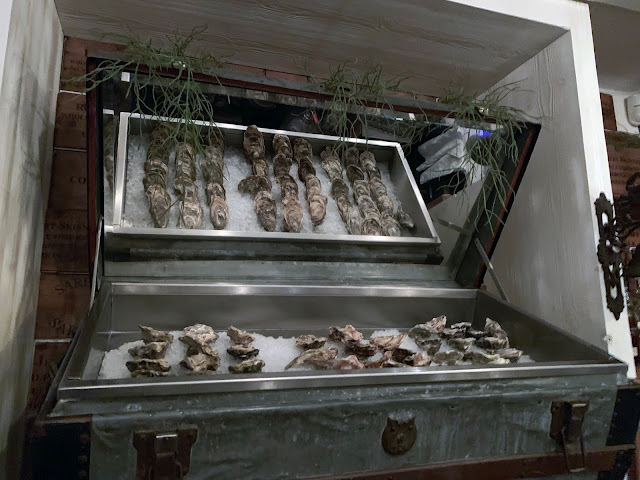 With a soft and meaty texture, and a sweet and fresh taste without a hint of grit or viscera, the experience of eating them was far closer to that of premium seafood such as lobster or langoustine than their closer relatives cockles. And they would have been beautiful enough on their own, I'm sure, but Murger serve them in the most extraordinary sesame and chilli sauce, a perfect foil to the meat. At £3.50/skewer and with a minimum order of 5 (we had 6), these guys aren't cheap, but take it from me, they're worth every penny. 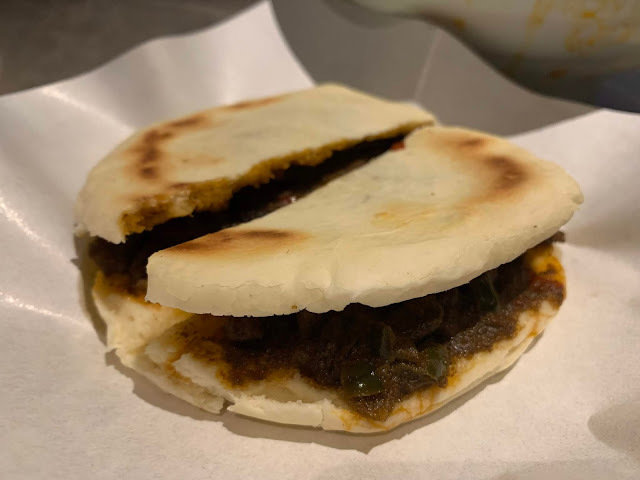 Also brilliant, and completely new to me, was the titular "murger", a kind of loose meat sandwich made with grilled flatbread. The beef mixture was richly spiced with chilli and I'm guessing a bewildering number of Chinese seasonings involving five spice. It wasn't dripping with juices like a normal beefburger, instead it was more like the Tayyabs "dry meat" - not actually dry as such, just dense, and absolutely full of flavour. 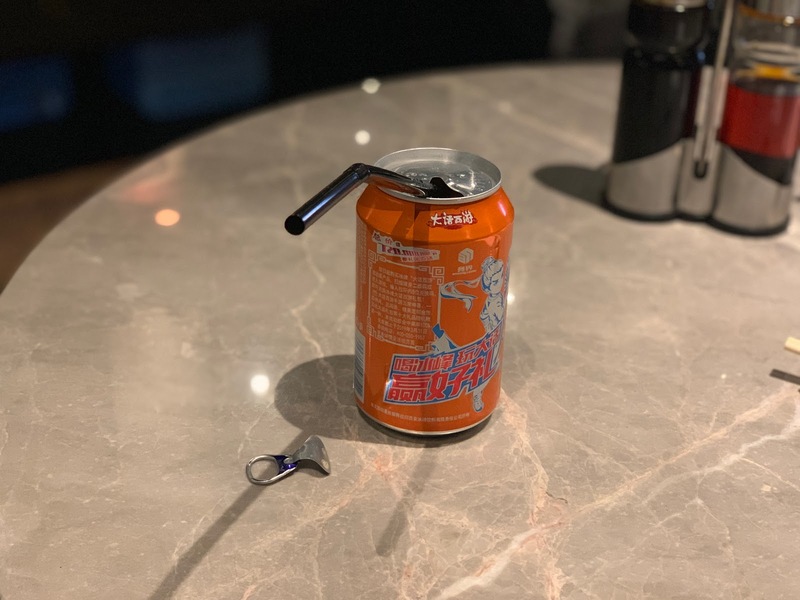 We noticed from a quick glance around the room that this seems to be the one "must order" item at Murger HanHan; literally every table had one. Finally, the Biang Biang noodles, and oh boy were they something. They're actually probably best described in the singular, as "noodle"; one vast, thick piece of gluten coiled up in the bowl, delightfully al-dente and almost completely impossible to share - I recommend bringing scissors if you're eating with a friend and want to share. Or just get a bowl each - they're that good you probably won't want to share anyway. 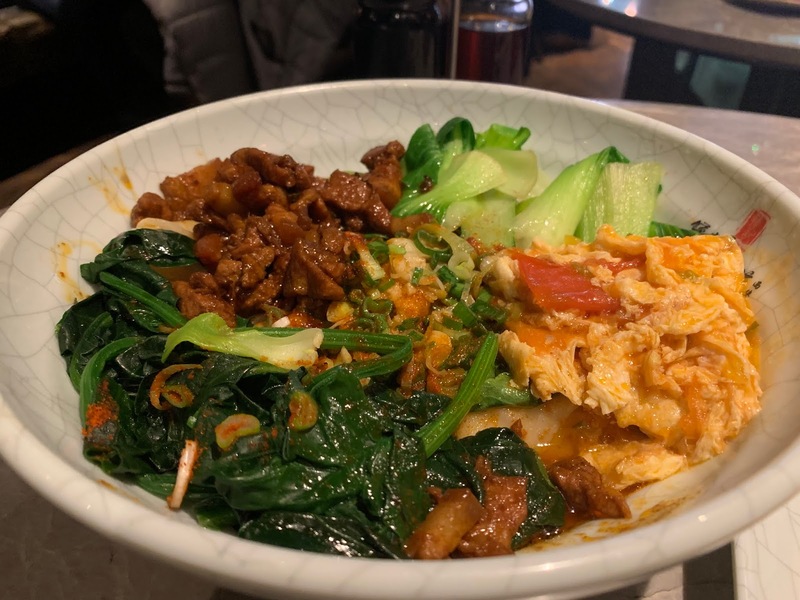 Into the mix was a healthy pile of braised pork, all tender and glossy with sauce, some very clever egg which seemed to have somehow been poached in tomato broth, giving it a fantastic depth of flavour, and also some vibrant Chinese greens to provide colour and crunch. Alongside the Kanada-Ya ramen, or the Café East pho, this is surely one of the great London noodle dishes. 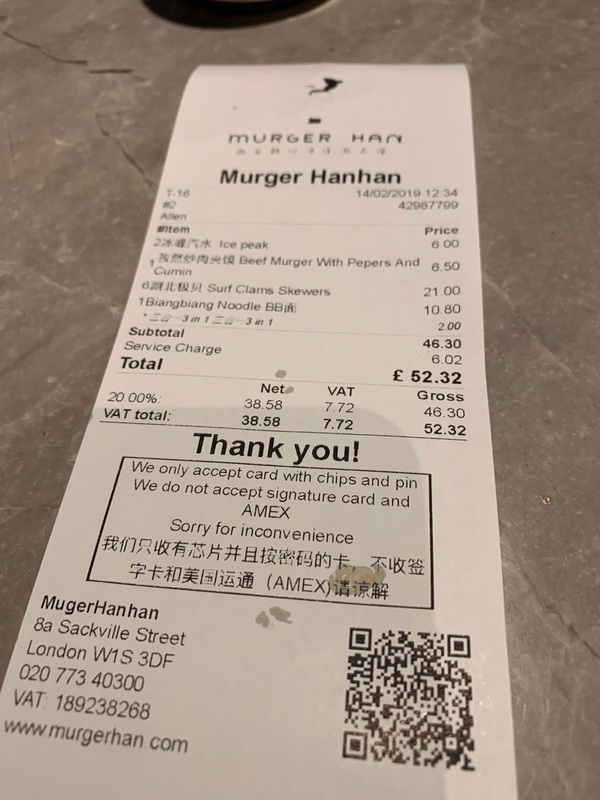 We left Murger HanHan on this chilly weekday lunchtime splattered with pork juices, £26 a head down, and very happy indeed. Not just because we'd had a great lunch - though we certainly had that - but also for the reminder that after all this time, and despite all the looming political problems that may well still bite in the coming months, London still has the ability to showcase exciting variations of Chinese food to stunning effect. If this is the way things are going - short menus, strictly regional, uncompromising authenticity - then we have a lot to look forward to. 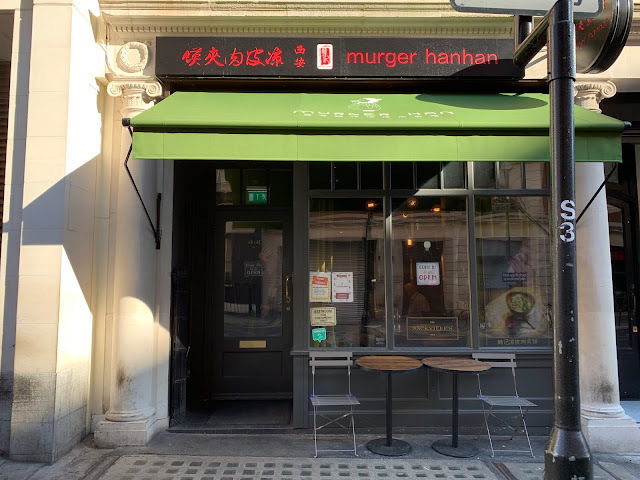 Murger HanHan may prove to be not merely a great restaurant, but a reason to be hopeful about the state of things more generally. Or at the very least, an extremely welcome distraction. The other day I spotted on my twitter feed a menu from an Alain Ducasse restaurant. 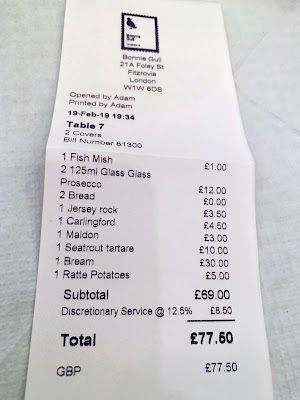 It was posted by Nottingham-based chef Sat Bains, without much comment other than to indicate he was very much looking forward to trying it (and who can blame him with turbot and lobster on offer), but there was something about this menu that I couldn't quite work out. Where in the world was this place? Were those prices in Japanese yen? No, far too cheap. Hong Kong dollars, making the starters between £13-£20? Possibly, though none of the ingredients looked particularly Far Eastern. I googled "Le Meurice". You're probably ahead of me. Turns out, Le Meurice is a hotel in Paris. Those prices are in euros. At the current exchange rates (thank you Brexit) the average British holidaymaker (though I imagine there's nothing average about the kind of British holidaymaker that makes a reservation at Le Meurice) would expect to receive a l'addition of about £1000 per head - and I'm sorry, I don't care how much better Brittany lobsters are than Brixham, or if the Ducasse pasta is that much better than Bancone (though it seems unlikely), this is an obscene amount of money. By way of contrast, Sat Bains' own restaurant, which currently also holds two Michelin stars, will serve you a seven-course tasting menu, including drinks and service, for less than the price of a single starter at Le Meurice. And I'm pretty sure eating in a 5-star hotel in the 1st arrondissement as opposed to an industrial estate under a motorway flyover in the East Midlands can't account for very much of that discrepancy. The fact is, for as long as Brexit hasn't tipped the whole chessboard up, we have it pretty good here in London. The cheapest way to enjoy Anne-Sophie Pic's food in her home country is the €120 lunch menu - very nice I'm sure, but no choice, and only three courses. At La Dame de Pic in the very grand Four Seasons Trinity Square in London, a lunch menu is £60 for four courses with plenty of interesting choices, and you can make all sorts of claims about the quality of ingredients in Valence as compared to the UK if you like, but you must at least concede that the techniques and ability in the kitchen, and the levels of service from the front of house, are going to match up pretty well. Of course, this being a fancypants restaurant in a 5-star hotel, even the lesser menus are embellished with plenty of extra bits and pieces. Leading the charge was a stunning langoustine-yuzu consommé, the kind of thing only a tiny handful of the world's top chefs could produce with such an incredibly delicate balance between seafood richness and citrus perfume. It was absolutely wonderful, and I could have downed a bucketload of the stuff. ...and finally a huge crab shell containing two balls of some kind of citrusy liquid that exploded quite amus(bouch)ingly in the mouth. My only slightly criticism is that when something is presented in a crab shell, I'd quite like the edible portion to contain some crab. Ditto the whelk (though perhaps not the coral). Still, all very impressive nonetheless. And this is stout butter, cleverly arranged into the shape of a flower. Perhaps the shape of a mini pint of Guinness may have been more appropriate, if somewhat less attractive. It came with a superb sourdough (not pictured sorry) which had an interesting slightly sweet note, which worked incredibly well. Then one final off-menu appetiser - cute little curls of gently pickled carrot, set in a kind of jasmine and carrot jelly. Perhaps a little fridge-fresh for my liking, but that could have been a deliberate tactic to keep the jelly together. The flavours were nice though - floral and heady. Finally, the menu itself began with the Pic signature dish. "Berlingots" are apparently little pasta parcels stuffed with seasonal cheese (at this time of year, Gruyere and Vacherin) and wild mushrooms. Tesselated neatly on the plate, they were then dressed with what the menu said was "Woodruff, barley and roasted hazelnut consommé" but I'm pretty sure there was some umami-spiked, earthy mushroom stock in there as well. 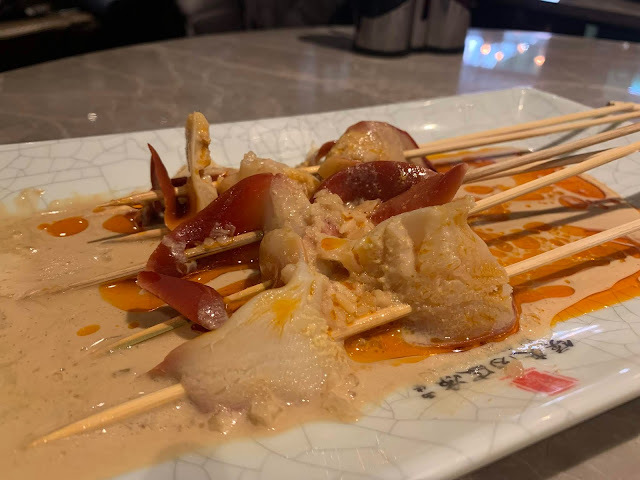 The dumplings - sorry, Berlingots - themselves were exquisitely constructed things, the casings al-dente but still delicate enough to burst with gentle pressure in the mouth to release a smooth, rich cheese sauce. Together with the consommé they made one of those perfect seasonal dishes, where every element is a hymn to the bounty of the land and for as long as this dish was available you'd be happy if winter lasted twelve months. Unbelievably, the main course was even more impressive. I can hear the words "game pithivier" at the best of times and my heart skips a beat - the version made with grouse at the Holborn Dining Rooms is always worth spending time on - but here, with tender chunks of funky venison and buttery foie wrapped in a coarse, offaly paste and encased in golden flaky pastry, it was even more gasp-inducingly decadent, a true masterclass. Sat in another beautifully constructed game sauce, the kind you find yourself scraping up with your fork once it cools and lapping up like Marmite. Or maybe that's just me. I was also lucky enough to sample a bit of the turbot main, which was as densely-flavoured and meaty as only the best (or rather biggest) turbot can be, dressed in yet another wonderful seafood sauce. For dessert, we had the famous Pic millefuille, and I must have been really enjoying myself and the matching French wines by this point because I completely forgot to take a photo of it with my good camera. 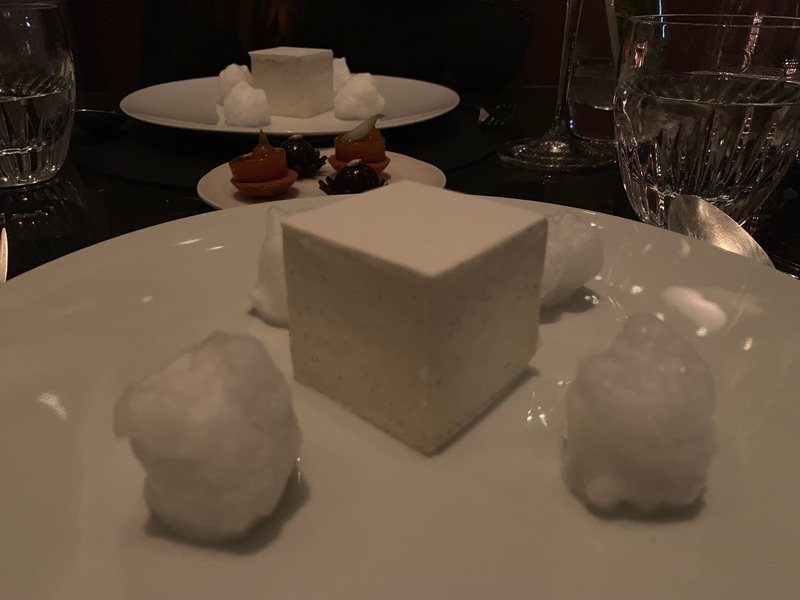 Anyway apologies for the murky shot above, but it's a lot better than I've made it look - the layers inside included vanilla ice cream, pastry and cream, all encased in a white chocolate cube. Quite a striking thing, and that I thought it was perhaps a teeny bit style over substance is probably just due to the fact I'm not much of a pastry person. I do appreciate the effort, though. 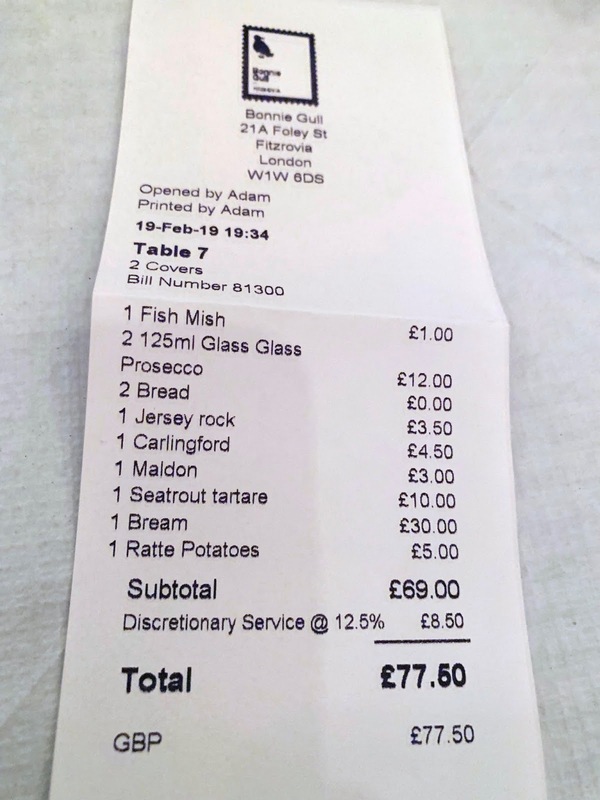 I didn't see a bill, this being a PR-led exercise, but as ever you're more likely to get better value on a weekday lunchtime than going full tasting menu of an evening. Of course food like this isn't cheap, and neither should it be, but I can tell you I've had much worse food at a similar price point, not least Anne-Sophie Pic's fellow countryman Alain Ducasse - yes, he of the €180 starter - whose London outpost at the Dorchester left me completely baffled. So yes, for as long as it lasts, we do have it pretty good here in London. True, occasionally international chefs treat the city as a bit of a cash cow, opening half-hearted branding exercises with little of the style or effort of the original (I'm looking at you as well, Ametsa with Arzak Instruction) but on the rare occasions where continental operators have their heart in the right place and put the hours in, you can eat berlingots and game pithivier for as much as a 5-star hotel in Paris would charge you for an extra shaving of black truffle. At least, for now you can. Better get your reservation in before March 29th, eh? I was invited to La Dame de Pic and didn't see a bill. 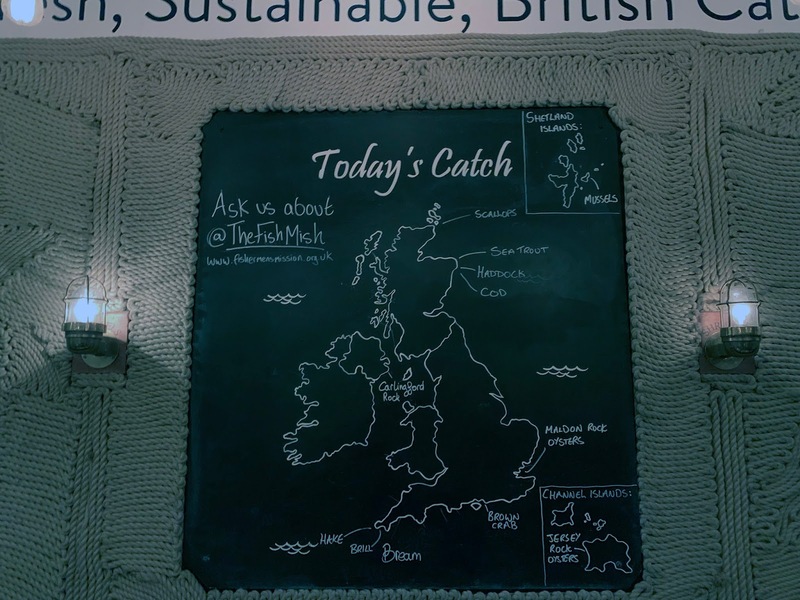 The Mash Inn, nestled in the Chiltern Hills fifteen minutes drive outside of High Wycombe, would be well worth a visit even if just to sit by the wood fire in one of the cosy corners of this ancient building and nurse a pint of local ale. It's one of those places that just the pleasure of occupying a part of it for an hour or two is worth the cost of the trip out of London alone, and though I'm sure it's delightful whatever the weather outside, this particular weekend a light snowfall the night before had lent its ancient aspect an extra touch of winter magic, and its warm, dark interiors beckoned even more enticingly. But the Mash is not just a very pretty face. Inside, one of the aforementioned cosy corners is taken up by a bijou but well-appointed open kitchen, with a butchery table in constant use and one of those Extebarri-style winched wood-fired grills looking like some kind of medieval torture device. It's a kitchen that means business, and the attitude carries through to the menu, which lists a number of niche ingredients that would evade the sourcing talents of many lesser restaurants - sea urchin, muntjac deer, pheasant. What exactly we were going to be served was to be a mystery though - our table of ten, assembled from far and wide (OK most of us got the train from Marylebone) were to be in the hands of chef Jon Parry for the afternoon, and after a few moments huddled in the bar nursing a traditional local... gin martini, we were ushered into the brighter dining room in the back to eat. As a philosophy, "getting hold of the very best seasonal ingredients and presenting them simply, and well" is hardly unique in the culinary world, but it's surprising the number of places that either get the basics wrong, such as timing of meat or fish, or alternatively can't resist the urge to add one or two unnecessary extra flourishes to a dish. Everything at the Mash Inn is exquisitely tasteful, and nothing is unnecessary - such as these vibrant radishes, lightly dressed and seasoned, with a clever hay-smoked mayonnaise. Next an impressively gooey burrata, studded with fermented cherries (anything you see that isn't strictly seasonal has most likely been kept pickled, and with so little room in the kitchen the jars of weird and wonderful ingredients appear in all corners of the pub, lending the place an air of an eccentric alchemist's study). On top, a pile of fresh black truffle, because why the hell not, and on the side a completely wonderful grilled flatbread slicked with fermented wild garlic which was like God's own garlic bread. Oh yes, we were enjoying ourselves by this point alright. 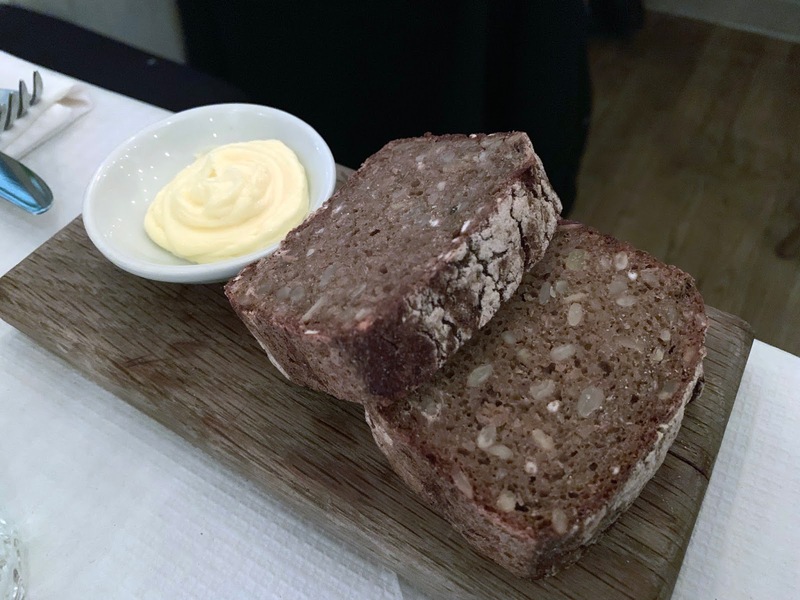 "Burned leek and bog butter" was something I'd been thinking about ever since scanning the sample menus on the pub website a few months back, and did not disappoint. The leeks are charred on the grill, then the outer blackened layers removed to leave a supremely tender and sweet core. This is then dressed with a hollandaise made from butter that had been, well, literally stored in a bog, taking on all the peaty flavours. Where exactly one finds a bog in the Chilterns I'm not sure, but I suppose the Mash would need to keep the exact location under wraps in case anyone stole their carefully ageing butter under cover of darkness. Anyway this was a brilliant dish, with more shaved truffle exactly the right way of finishing it off. I don't know where the Mash get their scallops from, but I need to find out, because these were the sweetest, plumpest and most perfect scallops I can remember eating in a long time. But it wasn't all just down to clever sourcing - bucking the 'rawer the better' trend that seems to be the norm these days, instead this beastie was caramelised to golden brown on the outside and with a satisfying solid, meaty texture within. Lifted with some foraged succulents and a bit of pickled ginger, it was pretty much the perfect seafood course. Then the Main Event. Now, Mash weren't to know that not two months ago I'd sat down to lunch at what is generally regarded as the best Asador in the world, Etxebarri in Northern Spain, and eaten the best bit of txuleton I've ever had in my life. They weren't to know that, having seen the rack-winch grills in the corner of the kitchen at Mash that I had high hopes for their way with a bit of protein on the bone, and despite trying to keep my expectations in check, they weren't to know that there would be a part of me that was always likely to compare the one real-fire restaurant with the other. But they really needn't have worried. True, the Galician steak is that extra level of marbling and beefiness above even the finest of UK cow, but the way it was treated - with a delicate dark crust from super-precise grilling, and perfectly rare inside - was absolutely Etxebarri level. I mean just look at it. Plus, Extebarri didn't do chips, and Mash Inn do excellent matchstick fries, cooked in beef tallow if I'm not mistaken, for that extra deep richness of animal fat. They also served grilled baby gem lettuce with crunchy, chillified XO sauce, which were lovely, and everyone got a bit of breadcrumbed bonemarrow too which we first scooped out and ate, then used for making bonemarrow sherry luges. Ah yes, about that. There were ten of us, we took up a good portion of the restaurant, it was a birthday celebration, we'd started drinking Cava before we'd even left Marylebone station, and I'm afraid by the time the (super, though don't expect me to tell you what they were) cheese course came around there was a certain atmosphere of, shall we say, exuberance. I don't think we made a nuisance of ourselves, or annoyed any of the other guests (I'm always fiercely aware of how bloody awful it is when you're sat next to a noisy table) but thanks to the giddy exceptionalism of the food and the ease of ordering yet another bottle of wine, events did rather run away from us. 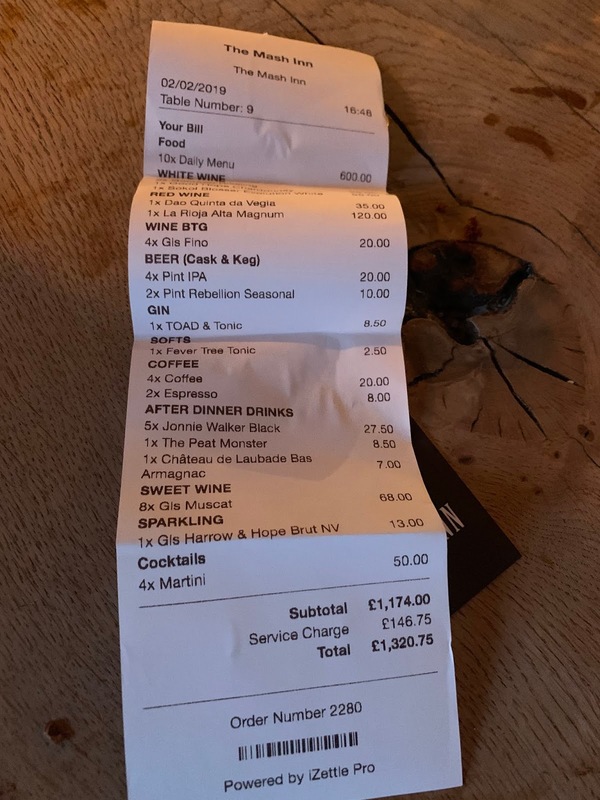 Those of a nervous disposition may want to avoid looking at the following bill. But you know what, it was worth it and then some. Only very rarely is fierce ambition like this - to cook everything over fire, and to use only the finest local and seasonal ingredients - matched with enough talent to not have the results lapse into some kind of hipster gastropub cliché, or to be overbearing and pompous. The menu at the Mash is serious, and seriously impressive, but also effortless, borne of the joy of being able to serve exactly the kind of food they want to cook. As winter turns into spring and them summer, the idea of revisiting the Mash to try asparagus, or grouse, or even oysters prepared on that wood-fired grill becomes deliriously tempting. And as I've never been very good at resisting temptation, I imagine I'll be back as soon as the snow melts.